After finding out that this is the Mendy Werzberger I grew up with as a child in Toronto, I felt really excited and happy for him that he was zoiche to release his own album. Then when I actually heard it, I was really impressed . Before writing reviews, I like to read the booklet to find out as much background as possible on the album. However, upon reading this booklet, I was actually saddened when I learned that Mendy went through several tragedies in his life including the loss of his mother and brother a”h. So with these mixed emotions, let us begin. 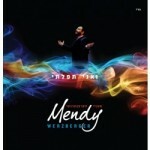 Although this is Mendy’s first album, I have heard him on Mendy Wald’s album Echod and on the Unity song that was performed to support Sholom Rubashkin. His voice is unique that it is thin and soothingly sweet and it puts a person in a calm state. He is full of hartz and gefeel. Most of the songs were composed by him as well and that gives him more points if you’re keeping score! The album starts off with V’ani Sefilosi and it sets the theme of the album which is about Tefilla in the most part. It’s a gorgeous song that gets better and better each time you listen to it. It’s medium speed, but it has an upbeat up tempo that is inspired by his voice. One of the hits is the 4th song called “Todah” composed by Mendy and arranged by Yitzy Schwartz & Eli Lishinsky. It’s a Middle-East style Hebrew Hora sung in the Sefardic pronunciation about gratitude to Hashem about his chesed and emphasizes thanks to Hashem for giving us strength to daven and for being able to overcome adversity. Following Todah is “Eloikai Neshomo” – another hit because it is a great song and because it is sung with alternate solos by Yitzy Waldner who co-composed the song together with Mendy. They sound phenomenal together! The song is mid speed with a great beat and starts off a little similar to Michoel Streicher’s Eloikai Neshomo, but then quickly takes on its own identity. At he 1:47 mark he goes really high “Todah, Todah” – Mosuk K’Davash! Another hit is Boirei Oilom – the 7th song. A great upbeat techno song and the music is arranged by Shai Bachar and there are backup vocals by Shloimie Kaufman which adds a lot of flavor. Mendy puts his heart and soul, virtually his whole neshomo into the song as he beseeches Hashem “Rachamecha Yichmeru….” Just awesome! At he 3:10 mark it repeats “kavanosi” over and over many times to teach us to the main thing is our intent. Reb Avigdor Miller zt’l said that if one puts in an intent to serve Hashem to his mitzva even if it’s not the sole intent, it still transforms the mitzva into something much more holy. The 9th song is “Mendy’s Instramental” an original concept to compose a song without words and it’s in fact quite daring. Another unique factor is the main instrument chosen is some type of flute that is hauntingly beautiful with just a touch of melancholy, but upbeat enough to not a person feel down. In fact , the style of the song is quite upbeat and optimistic and has some kneitchen of a chasiddishe nigun style while at the same time being techno – hora style. The final song is a powerful slow English in memory of Mendy’s mother and will melt any heart – even a heart of pure stone. The song is enhanced by background vocals performed by the one and only Yitzy Spinner. There are certain parts that sound like an MBD song but Mendy is courageous enough to be his authentic self and not try to imitate MBD. He goes really high after the 5 minute mark. To sum up, Mendy has treated us to something really special. When you buy it, you will find yourself listening to it over and over again.